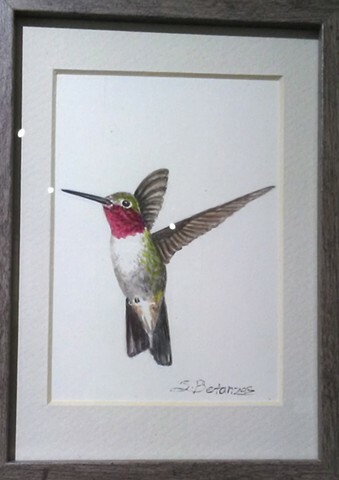 An original watercolor study of a Ruby Throated Hummingbird. These hummingbirds are amazing travelers, migrating hundreds of miles each summer and fall. This photo is taken directly from the gallery where is is available, hence the glare spots. It is a sweet little painting for hummingbird lovers! The watercolor comes matted and framed. Stop by the gallery at Agua Caliente Park in Tucson, AZ to say hello and see the Art in the Park!